You know, I never heard much about Delaware through the years, and never had a real reason to visit the state. I wish I could tell you that the state highpoint is that reason I’ve always been looking for, but, well, it isn’t. Delaware’s highpoint, at 448 feet above sea level, is the second lowest in the U.S., ahead of only Florida’s Britton Hill. It’s third-highest if you count Washington D.C.’s highpoint on the list. But then there’s the name: Ebright Azimuth. Where does it come from? Apparently the origin of this name is as mysterious as this tiny state itself. James and Grant Ebright owned the property on which the highpoint resides, so that explains part of the name, but I’m uncertain as to the true beginnings of this curious name. This highpoint is a literal drive-up in its truest form. The highest natural point in DE resides near the Pennsylvania border, in Barkley, DE, an unincorporated community in New Castle County. The area is approximately 6 miles north of downtown Wilmington, DE. 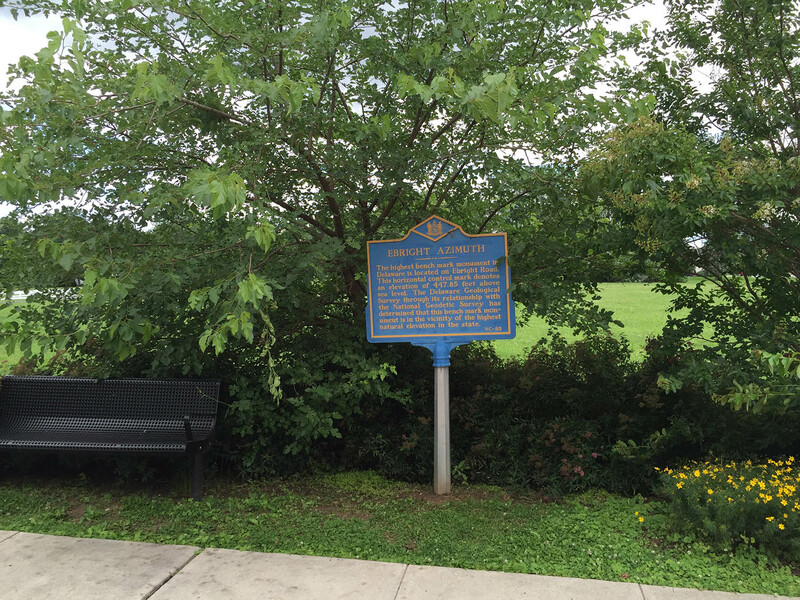 The benchmark is located on Ebright Road near the intersection of Ebright Road and Ramblewood Drive. Park legally somewhere nearby and enjoy the views. For those of you highpointing perfectionists, there is a (raging?) debate about the true highpoint of Delaware that may or may not be the current marker at 448 feet above sea level. Debate about state highpoints is not all that uncommon. For example, Michigan’s highpoint got switched to Mount Arvon in the early 1980’s after a nearby mountain, Mount Curwood, was thought to be the highest in the state. And there’s the never-ending debate in Colorado as to whether the true highpoint should be Mount Elbert or its neighbor Mount Massive. In the 1970’s there was reportedly a feud that broke out where climbers were stacking rocks atop Massive in order to make the mountain surpass Elbert in height. 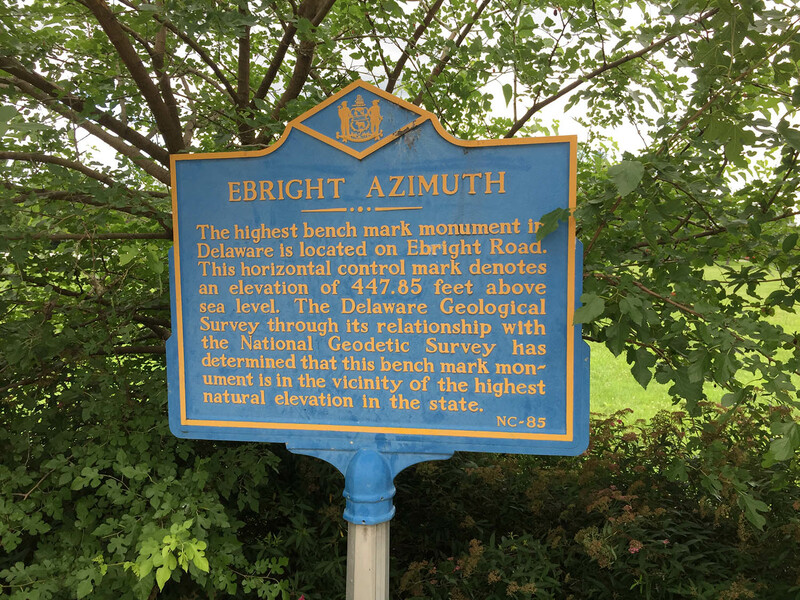 So, some believe that an area nearby Ebright Azimuth is two feet higher, making the official Delaware mark 450 feet above sea level. For specifics, consult The Delaware Geological Survey. Elevation change (estimate): 1 foot?